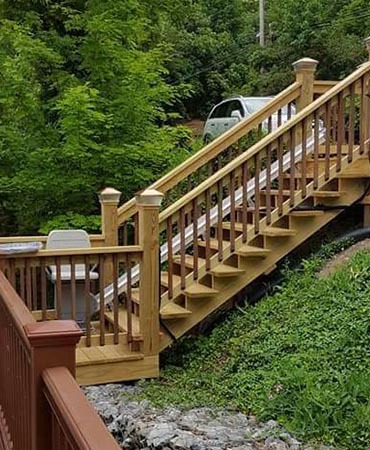 The Stannah 320 is a practical solution where you have a straight staircase and need to access your driveway, deck or yard. Quickly fastened to a few of the stair treads, the 320 is easier to install than a ramp and takes up much less room. The 320 was designed to withstand both hot and cold climates, and has a good track record in locations as diverse as New England and Hawaii. Operating the Stannah 320 couldn’t be easier. After sitting in the secure seat (which comes with a lap belt), move the joystick on the arm-rest to glide effortlessly up or down the stairs. At the top of the stairs you can turn the chair to face the landing. To access the great outdoors, it’s just the lift you need! 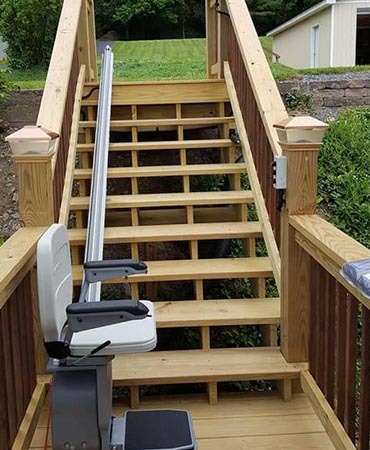 With its narrow rail and slim design, the 320 stairlift provides a space-saving way to access your driveway, deck or yard. To use the Stannah 320, simply unfold it, sit down and gently move the joystick on the end of the arm-rest in the direction you want to travel. 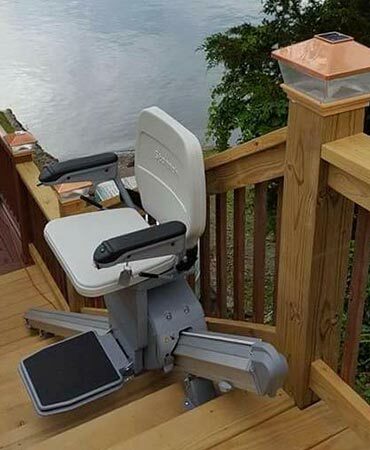 Landing controls (with key lock) let you call or send your stairlift – handy for carrying groceries. The 320 is weatherproof, and also comes with a protective cover to keep out leaves, ice and snow. 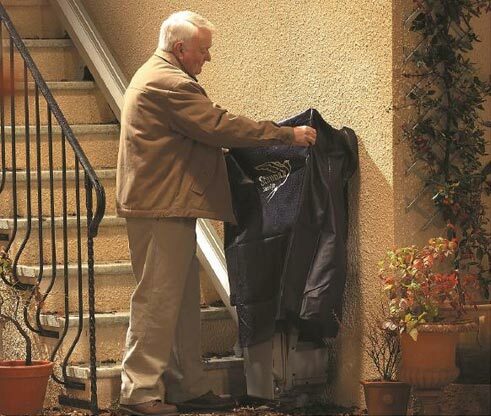 Batteries: Two 12-Volt batteries keep the stairlift working in the event of a power outage. Recharging is continuous and automatic, to overcome cold weather. 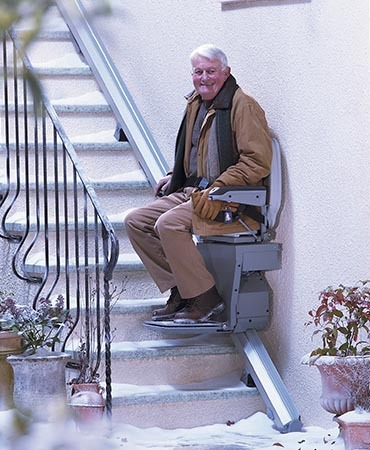 Safety edges: Sensitive safety edges stop the stairlift immediately if it meets an obstruction. The seat may be folded away when not in use. 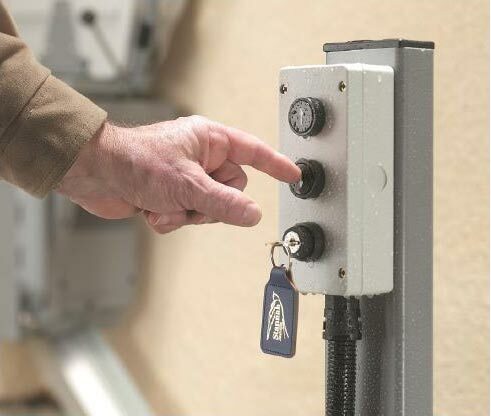 Whether you’re looking at new construction or retrofitting an existing home or building, adding an outdoor lift can provide a safe and convenient way to get to an outside location on a different level. Our stairlifts can be installed indoors or outdoors, they’re American made, and designed to help you create a more comfortable environment. Contact your local Access Elevator office today and our knowledgeable, professionally trained design consultants can help you find the stairlift that’s right for your budget and your facility. Our knowledgeable stairlift consultants are here to answer your questions. Give us a call today 888-668-5438.